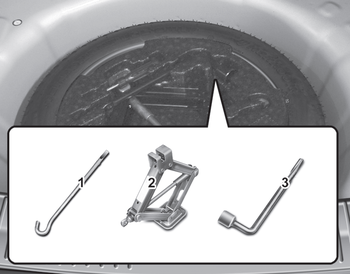 The jack, jack handle, wheel lug nut wrench are stored in the luggage compartment. Pull up the luggage box cover to reach this equipment. To prevent the jack from “rattling” while the vehicle is in motion, store it properly and fasten the jack screw fully. The vehicle can easily roll off the jack causing serious injury or death.